Have some extra ham from the holiday meal? 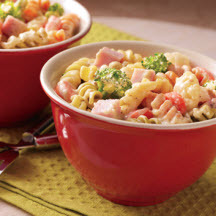 Then try this delicious blend of ham, pasta and vegetables in a creamy pesto sauce. This dish is so good, you’ll never think of it as a meal using leftovers. Nutritional Information Per Serving (1/10 of recipe): Calories: 330; Calories from Fat: 110; Total Fat: 12g (18% of DV); Saturated Fat: 6g (30% of DV); Cholesterol: 45mg (15% of DV); Sodium: 560mg (23% of DV); Carbohydrates: 36g (12% of DV); Dietary Fiber: 3g (12% of DV); Sugars: 5g; Protein: 19g; Vitamin A: 50% of DV; Vitamin C: 15% of DV; Calcium: 30% of DV; Iron: 10% of DV.